di cioccolato = of chocolate. Because the pie dough is a chocolate variation of the original. I really really wanted to bake a cake but I still don’t have a hand mixer and most of my cake recipes require one! Today while I was walking home after a lunch date with my hubby it hit me: crostata! No need for a hand mixer. With a pastry cream filling, because eggs in Germany look so delicious that they ought to be subjected to the pastry cream test! When a recipe has very few ingredients and is simple the only trick to make it turn delicious is good quality ingredients. The pastry cream is a good example. You need good eggs and good milk. My test succeeded by the way. Amazing pastry cream! To be eaten in spoonfuls!! 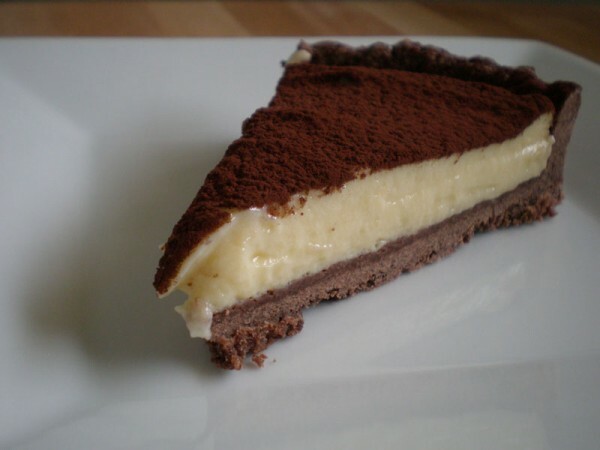 The recipe for the pastry cream comes from my beloved book: Pastry: Savory and Sweet by the French cook Michel Roux. I tell you: this recipe is a keeper! 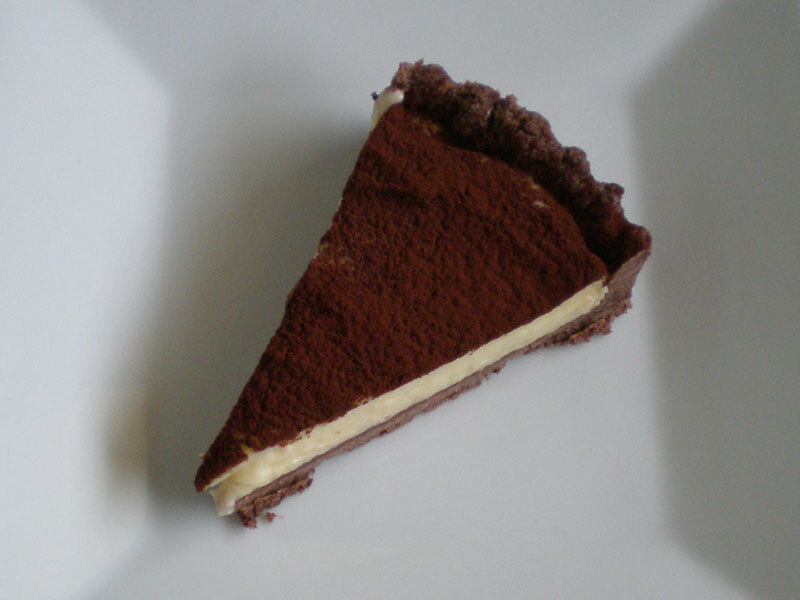 Sometimes, when I feel particularly sinful, I prepare a small amount of pastry cream, then I crush some cookies and place them on the bottom of a glass, sprinkle some espresso and liquor and pour the cream on top of it, warm cream :D Mmm yummy! But the chocolate tart makes it even better. So here I am, waiting for the butter to reach room temperature (a much faster task in Florida I tell you!) and scribbling down the recipe for you. 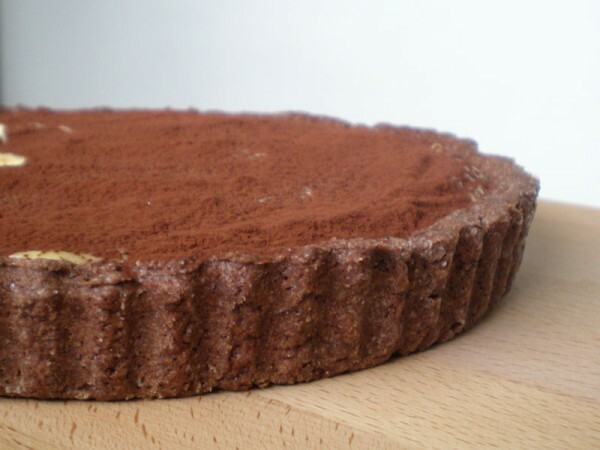 Start by preparing the dough for the tart, while it rests in the fridge you will prepare the pastry cream. Pour the flour in a bowl, cut the butter in small pieces and let it stand for some time until it has lost the chill from the fridge (picture 1). With the tips of your fingers quickly work together flour and butter until they are well combined and the mixture has the consistency of coarse sand (picture 2). Add sugar and cocoa and stir together. Add the egg and egg yolk, a pinch of salt and the liquor (optional). 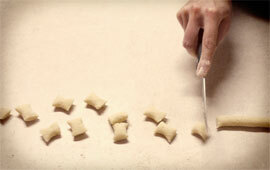 Knead the dough quickly and form a ball (picture 3). Wrap the dough in plastic wrap and let rest in the fridge for 30 minutes. I keep saying you have to do this quickly, that’s because you don’t want to melt the butter too much. And now, on to the pastry cream. Pour the milk, vanilla bean (or vanilla extract) and 2/3 of the sugar (80 gr) in a pot. Place on the stove and turn on the heat. You want it to reach boiling temperature. Meanwhile beat the egg yolks with 1/3 of the sugar (45 gr) until they are light and fluffy (picture 4 and 5). Add the flour and combine well. ^_^ Pretty egg yolks from two different brands in picture 4! As soon as the milk starts to boil pour it in the bowl with the beaten eggs and stir until everything is well combined. Pour back into the pan, put on the stove again and stirring continuously bring to a boil. Boil for just a couple of minutes (picture 7) then remove from heat. Transfer to a bowl, cover and let cool. It should be about time to complete the preparation of the tart. Preheat the oven to 180°C (360°F). Butter and flour lightly a tart pan. Take the dough from the fridge and roll it out, make it large enough to cover the bottom and sides of your pan. Place the dough on the pan and trim the eccessive dough. Prick the bottom of the tart with a fork (picture 8) and transfer to the oven. Bake for 20 minutes. It could happen that while in the oven the bottom of the tart “inflates”, don’t panic! Grab a fork and prick the point where the dough has risen. This will let the air escape and your tart will be just fine. Remove the pie crust from the oven (picture 9) and let cool. 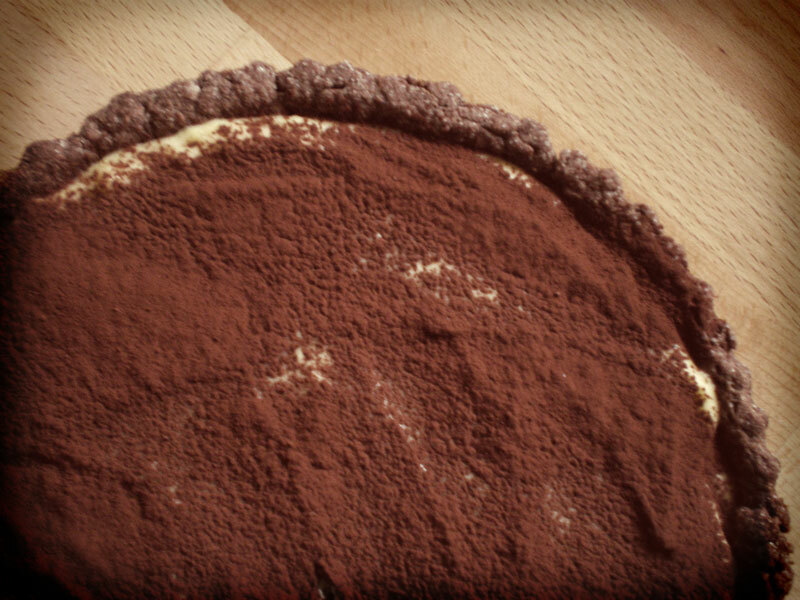 When everything has chilled pour the pastry cream in the pie crust, level and finally dust with cocoa powder. Max and I just enjoyed a big slice and we are craving much much more: DE-LI-CIOUS! 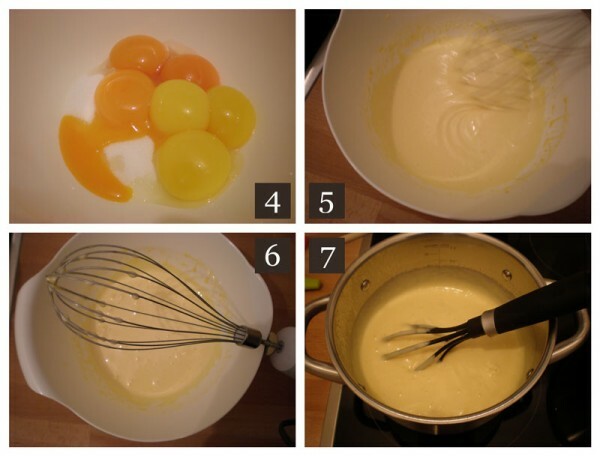 PS: yes, you really need 6 egg yolks for the pastry cream. But don’t worry we won’t waste the egg whites. Hold on to them I will post soon the complement to this recipe :) Or, you could always whip them up and make meringues! Hahaha you cracked me up :D No worries, you will look awesome THAT day!